Buenaventura's Uchucchacua operation. Photo from Instituto de Ingenieros de Minas del Perú's Twitter page. 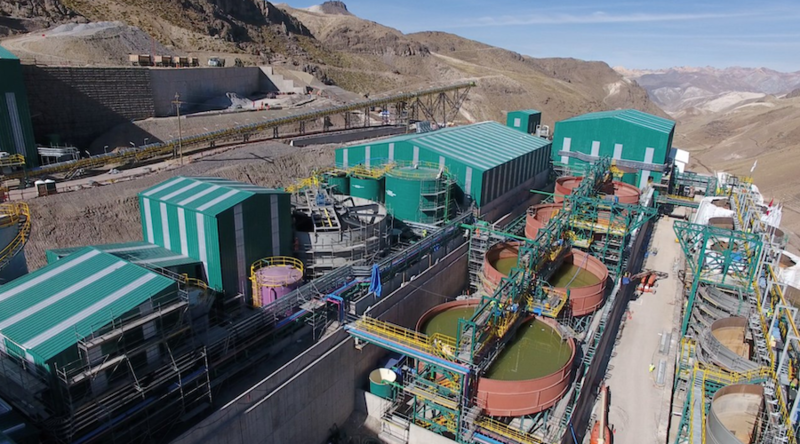 Peruvian company Buenaventura (NYSE: BVN; Lima Stock Exchange: BUE.LM) has been dealing in the past week with a worker strike at its silver-zinc-lead Uchucchacua mine, located in the central Oyón province. In a statement, management said the action was sparked by the company's decision to dismiss certain contracted employees, as they completed the work their companies were hired to do. But on January 9, 2019, the Contractors’ Union at Uchucchacua decided to start a strike action alleging grievances by the dismissed workers and also "unsuitable working conditions." Despite such accusations, the strike was deemed illegal by Peruvian Labour Authority. Thus, the miner says it is making efforts to resolve the situation as soon as possible. The Uchucchacua mine, which started operations in 1975, has had an annual production of about 16 million ounces of silver in recent years. The site is no stranger to protests and stoppages. Back in 2017, people from the nearby Oyón community caused disruption as they demanded compensation for land use. Buenaventura is the largest publicly-traded precious metals mining company in Peru with some 17 assets across the country and an important 43.65% stake in the Yanacocha gold mine, where it has a partnership with Newmont and Sumitomo.